We identified 212 articles coauthored by mentor-mentee partnerships. Mentees were first author on 83 of 212 articles (39.2%). Academic physicians with mentors produce more publications and receive more grant funding than those without mentors. Furthermore, mentorship during training can influence the mentee’s career choice and future success.1-7 We combined the disciplines of public health research and surgery to create a unique mentoring program to enhance the academic experience for public health students and clinical surgical faculty. We report participant characteristics and academic productivity of our structured mentoring program. In 2010, surgical faculty (led by A.H.H.) from The Johns Hopkins University School of Medicine collaborated with leaders of the Johns Hopkins Bloomberg School of Public Health (led by M.D.-W.) to establish a collaborative student mentoring program. The objectives of this new program were to develop competent, experienced academic surgical researchers and to assist students in reaching professional goals in surgical disciplines. During the first term of the academic year, interested public health students are matched with carefully selected surgical faculty (based on students’ areas of interest), who then work together to develop a research question and testable hypothesis. In addition to one-on-one project-specific meetings, students participate in biweekly meetings providing a structured curriculum. Early in the year, these meetings include faculty-led lectures or discussions on aspects of clinical research, including institutional review board processes, literature reviews, data analysis approaches, oral presentation skills, and manuscript writing. As the year continues, discussion topics mirror the academic curriculum and support progress on student projects. All students give “work in progress” talks to present their hypothesis, explain their scientific approach, review statistical methods, and receive feedback from faculty and peers. Many master of public health (MPH) students use this project to fulfill a mandatory capstone degree requirement. We examined cohort data to summarize participant characteristics. In September 2015, we searched PubMed for publications coauthored by the mentor-mentee pair, recording authorship positions and journal impact factor. Institutional review board approval was not necessary for this non–human participants study. It was exempt per the US Department of Health and Human Services protocol. 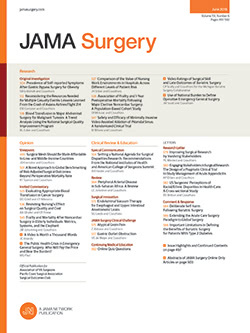 Between July 2010 and May 2015, a total of 90 public health master’s-degree students and 44 surgical faculty members participated in the Johns Hopkins Surgery Center for Outcomes Research (JSCOR) Surgery Faculty-Student Mentoring Program (http://www.jscor.org/surgery-mentoring-program). Mentees were 67.8% (61 of 90) male and 33.3% (30 of 90) underrepresented minorities. Many mentees were foreign medical graduate physicians (60.0% [54 of 90]), surgical residents (13.3% [12 of 90]), or medical students (30.0% [27 of 90]). Since completing the program, 39 mentees (43.3%) are now residents, with 56.4% (22 of 39) in general surgery (Table). Twenty-three of 90 mentees (25.6%) pursued careers in academic research. We identified 212 articles coauthored by mentor-mentee partnerships. Students were first author on 83 of 212 articles (39.2%). Overall, 47 of 90 mentees (52.2%) coauthored at least 1 publication, with 35 of 47 (74.5%) being first author. Of those who published at least 1 article, the mean and median numbers of publications were 5.3 and 2, respectively. The number of citations has risen each year (Figure). Mentees’ publications were published in 62 journals, including JAMA.8 Most common were JAMA Surgery (22 of 212 [10.4%]), Surgery (22 of 212 [10.4%]), and Journal of Gastrointestinal Surgery (16 of 212 [7.5%]). The mean journal impact factor varied by year (range, 2.54-3.93). The Johns Hopkins Surgery Center for Outcomes Research Surgery Faculty-Student Mentoring Program is a flagship example of collaboration for clinical and public health research in surgery. Most mentees published their projects in peer-reviewed journals, many as first author. Process standardization and year-to-year adjustments increased the program’s academic productivity, with mentor-mentee publications increasing in terms of quantity and impact across time. The program’s success attracted mentors from surgical subspecialties (eg, urology and orthopedics), broadening opportunities for students with diverse interests. The systematic application of public health methods to surgical research has greatly benefited students and mentors alike, illuminating important systems-level and population-level issues in health and health care.9 The inclusion of multiple surgical faculty using a standardized curriculum demonstrates the program’s long-term sustainability, even in times of change with the departure of a key faculty member (A.H.H.) and the transition to a new director (E.R.H.). This program has been valuable to all involved and could be used as a model to recreate at other institutions. Author Contributions: Dr Haut had full access to all the data in the study and takes responsibility for the integrity of the data and the accuracy of the data analysis. Acquisition, analysis, or interpretation of data: Smart, Zogg, Schneider, Haider. Drafting of the manuscript: Smart, Haring, Haider. Critical revision of the manuscript for important intellectual content: Smart, Zogg, Diener-West, Schneider, Haider, Haut. Administrative, technical, or material support: Haring, Zogg, Diener-West, Schneider, Haider. Study supervision: Schneider, Haider, Haut. Conflict of Interest Disclosures: Ms Zogg reported receiving grant T32GM007205 from the National Institutes of Health Medical Scientist Training Program. Dr Haider reported receiving contract AD-1306-03980 from the Patient-Centered Outcomes Research Institute and a Harvard Surgery Affinity Research Collaborative Program grant and reported being an equity holder in Patient Doctor Technologies, Inc. Dr Haut reported receiving grant 1R01HS024547 from the Agency for Healthcare Research and Quality, contract CE-12-11-4489 from the Patient-Centered Outcomes Research Institute, and book royalties from Lippincott Williams & Wilkins and reported being a paid consultant and speaker for the VHA IMPERATIV Advantage Performance Improvement Collaborative and the Illinois Surgical Quality Improvement Collaborative and the paid author of an article commissioned by the National Academy of Medicine. No other disclosures were reported. Disclaimer: Dr Haider is a deputy editor of JAMA Surgery but was not involved in the editorial review or the decision to accept the manuscript for publication. Additional Contributions: We acknowledge the following individuals at The Johns Hopkins University for their ongoing programmatic support: Joseph K. Canner, MHS (a critical member of the mentoring research team from the Johns Hopkins Surgery Center for Outcomes Research), the past (Julie A. Freischlag, MD) and current (Robert S. D. Higgins, MD) chairs of the Department of Surgery, Paul B. Rothman, MD (dean of the Medical Faculty of The Johns Hopkins University School of Medicine), and Michael J. Klag, MD (dean of the Johns Hopkins University Bloomberg School of Public Health). None received compensation.